In the early hours of July 4, 1776, Abraham Clark wrote his friend Elias Dayton, the Colonel of a battalion of Jersey troops at German Flatts, from his lodging in Philadelphia. hitherto Preserved us will I trust appear for our help, and prevent our being Crushed; If otherwise, his Will be done. Our Declaration of Independence I dare say you have seen. A few weeks will probably determine our fate. Perfect freedom, or Absolute Slavery. To some of us freedom or a halter. Our fates are in the hands of An Almighty God, to whom I can with pleasure confide my own; he can save us, or destroy us; his Councils are fixed and cannot be disappointed, and all his designs will be Accomplished. Clark was well aware, as were his fellow congressional delegates, of the gravity of the decision for independence from Great Britain as stated in an August 6th correspondence to the same friend, “Perhaps our Congress will be Exalted on a high Gallows.” Of the signers, Clark was a long-time public servant who held dear the concerns of the common man and the less fortunate. Clark historian, Ruth Bogin stated “Clark emerges as a champion of individual liberties, an enemy to every form of privilege, and a protagonist of government concern for the lowlier segments of the people.” One of five New Jersey delegates to the Continental Congress, Clark was prepared to risk everything he held dear for freedom from British tyranny. Abraham Clark was born in Elizabethtown, New Jersey on February 15, 1726 the only child of Thomas Clark (born 1701) and Hannah Winans, who married about 1724. The signer’s paternal grandparents were Elizabethtown residents, Thomas Clark (born 1670) and Margaret Duehurst, who married in 1692. Abraham’s great-grandparents, Richard Clark (1613-1697) and wife Elizabeth also lived in Elizabethtown. Richard emigrated from England to Barbados in 1634 where he resided until 1651 when he moved to Southampton, Long Island. In 1657, Richard Clark fought in the Indian War. By 1667, Richard and Elizabeth settled in Southold, Long Island, where he was a shipbuilder and planter. About 1675 the family moved to Elizabethtown where the Clark name became synonymous with public service. Abraham’s mother, Hannah, came from a family long in residence in the Elizabethtown area. Hannah’s parents were Samuel Winans, Sr. (1670-1747) and Zerviah (1684-1737). Abraham’s maternal great-grandparents John Winans (1640-1694) and Susanna Melyn (1645- c. 1688) married in New Haven, Connecticut, in August of 1664. John Winans, who emigrated from Holland, was one of the eighty associates that founded Elizabethtown in 1664. Over one-hundred-fifty Winans family members are buried in the cemetery adjacent to the First Presbyterian Church in present day Elizabeth, New Jersey, where the Clark and Winans families worshiped. Susanna Melyn, the signer’s maternal great-grandmother, was the daughter of another Holland immigrant, Cornelius Melyn (1600-1662) who married Jannetje Adriaens (1604-1681) in Amsterdam in 1627. Melyn first arrived in New Netherlands in 1638 but soon returned to bring his family to the colonies “with an order granting him most of Staten Island” stated biographer Della Gray Barthelmas. Later Melyn moved to New Amsterdam where he became the President of the Council of Eight, but returned to Staten Island in 1649. On February 7, 1657 Cornelius Melyn “took the oath of fidelity with twenty-nine others” when he settled in New Haven, Connecticut. Abraham Clark married Sarah Hatfield (sometimes spelled Hetfield) in 1748. It is said that Sarah was an intrepid and resourceful women whose industry allowed her husband the opportunity for decades of public service. Sarah was the eldest daughter of Isaac Hatfield and Sarah Price (1728-1804). A notable cousin of Sarah’s was Mrs. Robert Ogden who was the mother of General Mathias Ogden and Aaron Ogden, who would later become Governor of New Jersey. The Hatfield family were said to be a well-to-do and respectable family of Essex County, New Jersey. Another cousin of Sarah Hatfield Clark was the First Presbyterian Church trustee and patriot Cornelius Hatfield. His son, Cornelius Jr., sided with the Tory’s during the Revolution. The junior Hatfield reportedly led the British to his father’s church in Elizabethtown on January 25, 1780 where they burned the fiercely patriotic congregation’s church to the ground. The elder Hatfield offered the congregants the use of his barn until 1787 as a meeting place following the incident. The church was rebuilt and remains in operation today as a Presbyterian Church. such a one many would not Attend. He hath Composed a form of Prayer Unexceptionable to all parties. Abraham and Sarah had ten children during their marriage. Aaron Clark (1750-1811) was the eldest and served as a Second Lieutenant and Captain during the Revolution. 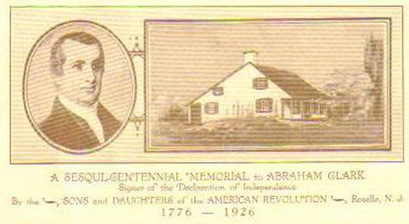 Aaron married Susanna Winans, daughter of Captain Benjamin Winans in 1775 and after the Revolution moved to Washington, Pennsylvania, in 1790. The couple bore seven children, five born in New Jersey and two in Pennsylvania. His brother, Thomas (c. 1755-1789) also served as a First Lieutenant and Captain during the Revolution and is thought to be one of the two Clark sons who the British incarcerated on the Jersey prison ship. It is reported that Thomas was confined to the dungeon and the only food given him was pressed through the keyhole of the cell. His health suffered tremendously which accounted for his early death. Both Aaron and Thomas served in the Eastern Company, New Jersey state artillery under Captain Daniel Neil in Colonel Henry Knox’s Regiment Continental Artillery and State Battery. The company fought at the battles of Trenton and Princeton. Sources state that a cannon ball fired by the Neil artillery regiment is still lodged in the wall of Nassau Hall at Princeton University. The third son, Abraham, born about 1755 died as a youngster in 1758. Hannah (born c. 1757), the eldest daughter, married Captain Melyn Miller, and fourth son Andrew (born 1759) died unmarried prior to 1794. Sarah was born in 1761 and later married General Clarkson Edgar. Cavilier Clark (born c. 1763) died in infancy a year after his birth. Elizabeth (born c. 1765) died from smallpox during the epidemic that spread across the revolutionary landscape in 1776. A fifth son named Abraham (born 1767), after his father and deceased brother, became a physician and married Lydia Griffith. The youngest child Abigail born in 1773 married Thomas Salter. Many of Abraham Clark’s children died childless or their offspring remained childless. At this writing verified descendants have been proven through Aaron, the eldest son’s line, and it is said through the second son Thomas, although verifiable documentation remains elusive. As seen above the Clarks and their relatives had long been Elizabethtown residents on the eve of the Revolution. Located in north New Jersey, Elizabethtown (now Elizabeth) sits directly across the channel from Staten Island and New York City. When England claimed the area from the Dutch in 1664 there were only 200 inhabitants. By 1776 the locality boasted a population of 125,000 and was, as Mark Di Ionno states the “commercial and cultural center” and leading “social and intellectual city in New Jersey.” New Jersey was the only colony that housed two colleges, Princeton and Rutgers. Princeton University was founded by the same First Presbyterian Church where the Clark family attended. The school was first called the College of New Jersey before moving to Princeton. The Old Academy building still remains on the church property and is marked by a small plaque. Notable students who attended at the location are Aaron Burr and Alexander Hamilton. The Clark property was situated about three to four miles from the Staten Island channel and comprised approximately three hundred acres. Because of Elizabethtown and New Jersey’s location during the Revolution, over one hundred battles and skirmishes occurred on its soil. The Clark property was destroyed, although the house remained safe during the conflict. Abraham Clark served the Crown for years before independence. From 1752-1766 Clark served as clerk of the New Jersey colonial legislature and became the high sheriff of Essex County. He was a man too frail for agrarian pursuits, but his bent toward math and civil law served him well, though very little of his schooling was considered formal. Clark’s occupation was that of surveying and preparation of deeds, mortgages, and other legal papers. Several historians, including Charles A. Goodrich, stated Clark earned the reputation as “the poor man’s counselor” because of his refusal to accept payment for legal advice. On the subject of law he was self-taught and most likely was never admitted to the bar. On the road to independence Clark served on the New Jersey Committee of Safety, for which he was secretary. Signer, John Hart also served with Clark on the Committee of Safety in New Jersey. After the execution of the Declaration, Clark’s public service continued until the end of his life. From Philadelphia on July 5, 1776, Clark wrote William Livingston, a former New Jersey delegate who had recently been chosen second Brigadier General of the New Jersey militia. In Clark’s letter to Livingston he stated, “I enclosed a Declaration of Congress, which is directed to be Published in all the Colonies, and Armies, and which I make no doubt you will Publish in your Brigade.” Throughout the war Clark raised supplies for Washington’s army, meanwhile nearly always present in Congress to vote. Many of the remaining Clark letters discuss troop movements and procurement.
. . . Our Congress have now under Consideration a Confederation of the States. Two Articles give great trouble, the one for fixing the Quotas of the States towards the Public expence and the other whether Each state shall have a Single Vote or in proportion to the Sums they raise or the num[be]r of Inhabitants they contain. I assure you the difficulties attending these Points at Times appear very Alarming. Nothing but the Present danger will ever make us all Agree, and I sometimes even fear that will be insufficient. Clark was elected to the Constitutional Convention of 1787 (for which he was too ill to attend), to the House of Representatives for the second and third U.S. Congress from 1791-1794, and served as trustee of the First Presbyterian Church. Following the Revolution, Clark served as a commissioner to settle New Jersey’s accounts with the federal government. Dennis B. Fradin stated it was upon Clark’s insistence the word “Liberty” was placed on the U.S. coinage. In 1784, The New Jersey legislature, of which Clark remained a member, passed “Clark’s Law” which was “An Act for Regulation and Shortening the Proceeding of the Courts of Law.” Bogin quoted Clark that, “If it succeeds, it will tear off the ruffles from the lawyer’s wrists” a nod to his disdain for pretense. In February, 1786 the Jersey legislature passed a bill sponsored by Clark for “An Act to prevent the Importation of Slaves . . . , and to authorize the Manumission of them under certain Restrictions and to prevent the Abuse of Slaves.” Even though Clark owned three slaves, and did not provide for their release until both he and Sarah died, this act was an important recognition by the legislature and Clark, as Bogin noted, that “slavery involved ethical considerations.” In 1794, Clark introduced a resolution in the U.S. House “to suspend all relations with England until all articles of the Treaty of Paris were executed” as reported by Barthelmas. The measure passed the House and was narrowly defeated by the Senate with the tie-breaking vote of John Adams. According to Fradin “Abraham Clark may have been the signer who was closest to being a typical citizen.” As seen above he hated pretense and elitism and never wore a wig or the ruffles of high social standing. Clark was very popular among the poor in New Jersey. Contemporaries commented that Clark was “limited in his circumstances, moderate in his desires, and unambitious of wealth” and “very temperate” as noted by Hatfield. According to historian, Edward C. Quinn, Clark “. . . regarded honesty, thrift, and independence as cardinal public virtues.” He loved to study and imbued a generous character. Clark was particularly admired for his punctuality, integrity and perseverance. Clark described himself as a Whig, and demonstrated throughout his life and in public service to be a champion of the people’s liberties. Bogin stated “One difference between Clark and many other Whigs [was he understood] . . . tyranny might arise from the new American centers of power as well as from the British . . . . Clark “did not believe men in public office should use their positions to confer favors on members of their personal families” according to Quinn. When his two sons were prisoners of war on the Jersey he refused to reveal the issue to Congressional delegates. Only when members found out about the treatment of Thomas Clark in the Jersey dungeon did intervention occur. When Congress threatened retaliatory measures on a British officer Clark’s son was released from the dungeon, but neither son escaped the Jersey until the general exchange of prisoners. The British offered to release Clark’s sons if he defected to the Tory side, but he refused. Abraham and Sarah’s burial site in the Rahway Cemetery. Several memorials survive attesting to Clark’s character and service. 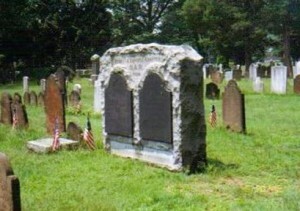 The stone slabs marking both Abraham and Sarah’s burial site in the Rahway Cemetery were encased in a monument at the gravesite in 1924 by the Rebecca Cornell DAR Chapter. Abraham’s son Captain Thomas Clark is buried at the site as is son, Cavalier, and the elder Clark’s father Thomas Clark. 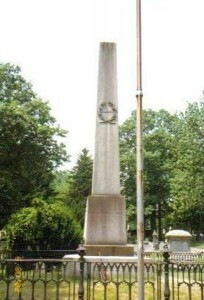 A 10-foot obelisk monument in Clark’s honor. The original Clark house was near the colonial Wheatsheaf Road, which is now Crane Street. After the house burned, around the beginning of the twentieth century, a replica house was planned with the issuance of the pamphlet above. 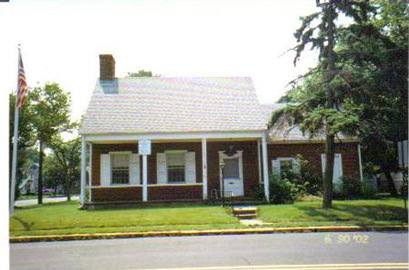 In 1940, the house was constructed on land once owned by Clark at Chestnut Street and Ninth Avenue in Roselle, New Jersey. The home has a small museum and serves as headquarters for SAR meetings and DAR gatherings. Mr. Robert Reynolds lives on the property and conducts tours of the museum and local Clark sites. The original Clark house was near the colonial Wheatsheaf Road, which is now Crane Street. After the house burned, around the beginning of the 20th century, a replica house was planned with the issuance of the pamphlet above. In 1940, the house was constructed on land once owned by Clark at Chestnut Street and Ninth Avenue. Local Boy Scouts Troops have placed stone and bronze markers at the corners of the property once owned by Abraham Clark. The Abraham Clark High School stands just a few blocks from the home. Most recently the formation of a law school is underway in Indiana named the Abraham Clark School of Law in the signer’s honor. In Washington, D.C. near the Washington Monument stands a granite boulder engraved with the name of Abraham Clark among the other signers of the Declaration. Nearby in the Rotunda at the National Archives Building Clark is memorialized in the large mural painting by Barry Faulkner and shown in the first row. John Trumbull’s famous painting housed in the U.S. Capitol building includes Clark among the fifty-six signers in a group of ten figures seated in the background. him from the confidence of the people, or shake his popularity. & pursuits tend to fit us for that important event. . . .
1665-1800, Vol. 29. The New Jersey Historical Society, Newark, N.J.
of Union County. New York: Carlton and Lanaham, 1868. Historical Society of Pennsylvania. Philadelphia, PA.
Gratz Collection, Declaration of Independence, Box 19. Barthelmas, Della Gray. The Signers of the Declaration of Independence: A Biographical and Genealogical Reference (Jefferson, North Carolina, and London: McFarland & Company, Inc., Publishers, 1997. Bogin, Ruth. Abraham Clark and the Quest for Equality in the Revolutionary Era, 1774-1794. Rutherford, Madison, Teaneck: Fairleigh Dickinson University Press; London and Toronto: Associated University Press, 1982. Di Ionno, Mark. A Guide to New Jersey’s Revolutionary War Trail for Families And History Buffs. New Brunswick, New Jersey, and London: Rutgers University Press. Ellison, Harry C. Church of the Founding Fathers of New Jersey, A History: First Presbyterian Church, Elizabeth, New Jersey, 1664-1964. Cornish, Maine: Carbrook Press, 1964. Fradin, Dennis Brindell. 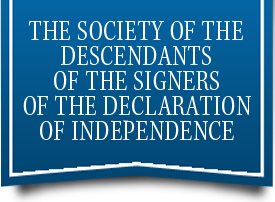 The Signers: The 56 Stories Behind the Declaration of Independence. New York: Walker and Company, 2002. Goodrich, Charles A. 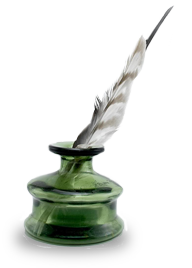 Our Lives, our Fortunes, and Our Sacred Honour: The Lives of the Signers to the Declaration of Independence. New York: William Reed and Co., 1829. New edition, Birmingham, AL, 2005. Declaration of Independence. Aledo, Texas: Wall Builder Press, 1997. Hammond, Cleon E. John Hart: The Biography of a Signer of the Declaration of Independence. Newfane, Vermont: The Pioneer Press, 1977. Lossing, B.J. Signers of the Declaration of Independence. New York: Geo. F. Cooledge and Brother, 1848. Reprint, Aledo, Texas, 1995, 1998. Munn, David C. Battles and Skirmishes in new Jersey of the American Revolution. Bureau of Geology and Topography, Department of Environmental Protection, 1976. Stryker, William S. The Battles of Trenton and Princeton. Boston and New York: Houghton, Mifflin and Company, The Riverside Press, Cambridge, 1898. Quinn, Brother C. Edward. The Signers of the Declaration of Independence. New York: The Bronx county Historical Society, 1988. Ruth we are so glad you found the site useful. BTW, we do have a record of a Ruth Evelyn Clark, b. 1919 in Kansas. Ruth Evelyn Clark was my father’s sister. She was not born in Kansas. She was born in Wayne, Nebraska, as was my father Robert Anson Clark (eldest sibling, b. 1909) and three of their other siblings Harold Samuelson Clark, Charles Edward Clark, and Doris Marie Clark. They were all the children of my grandfather Ralph Anson Clark [son of John Robert Clark (b. 1850, Peoria, IL), grandson of Robert Anson Clark (b. 1824 Wheatsheaf), great grandson of John Marsh Clark (b. 1767, Rahway, NJ), great-great grandson of Robert Clark (b. about 1733, Rahway, NJ), g-g-g gs of Joshua Clark (b. about 1689), g-g-g-g gs of Joshua Clark (b. 1668 in Southold, Suffolk, NY), and g-g-g-g-g gs of Richard Clarke (b. bet. 1632 – 1640 in Bradwell, Suffolk, England d. April 1697 in Elizabeth, Essex, NJ), g-g-g-g-g-g gs of Richard Clarke (b. Richard Clarke b. abt. 1618 in Bradwell, Suffolk, England)] … if my family research is correct. Any validation would be much appreciated. Ruth, I can confirm that none of the names you have presented are descendants of Abraham Clark, the Signer of the Declaration of Independence. I believe that Abraham Clark is one of my relatives, having always been told this. I have a pair of gold cuff links with the initials S. S. Clark which I was told came from his family. I also have a survey of part of Elizabethtown, and several letters by Joseph Clark Esq. to Ward that were written during the Revolution war. I would like to find out more about these items. My wife’s maiden name is Clark, and they have traced their ancestry back to Abraham Clark. This branch of the family is centered in the MO/KS/IA area. Is it permitted to post a note about a family reunion that will be held this year on June 8, 2013 in Lemons, MO and have contact info listed? Thank You. John, we would first have to confirm that this family is indeed in the line of descent from the Signer.